We have puppies! Lots of puppies! For the first time in a long time, we have more puppies than deposits. This means that NOW is a great time to get on the waiting list because your wait could be less than 8 weeks! I have updated the list and these are the deposits that we have received and have checks or Paypal deposits in hand. I know of 2-3 more that have been mailed and are “on the way”, so if your name is not here, and you’ve sent a deposit, keep checking in till you hear from me! I don’t want to miss anyone. I need to hear from ALL of you on this list. What color do you want? What gender? What timeframe? Let’s talk about some details!! 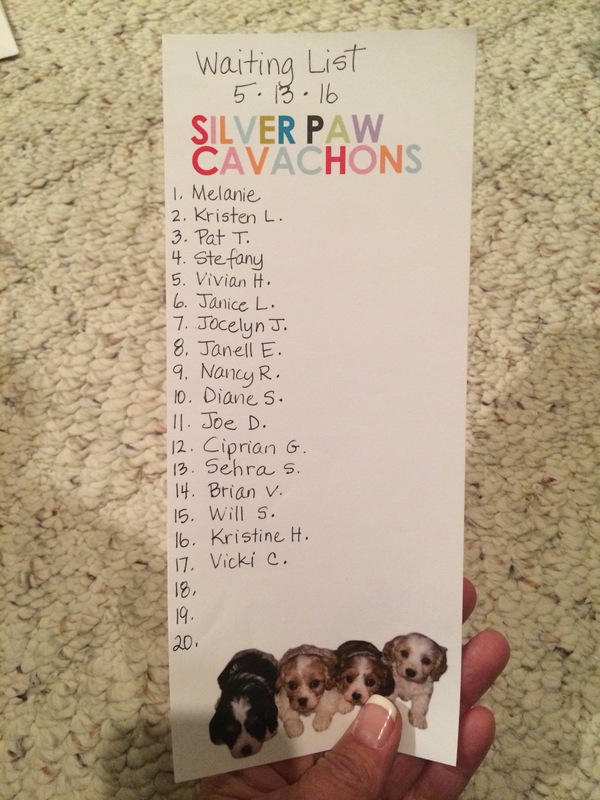 I want to write some info beside your names so we can get an idea of which puppies are likely going to be matched! I’ll post colors, genders, and available dates in the next blog post!